Written by Ryan Wolfe Win. That is all which keeps a manager in the BPL employed. The more you lose the quicker you are to be sacked, made the villain and abused every way to Sunday. Perfect example is David Moyes. He didn't ask to be anointed the "chosen one" or have Fergie constantly be in the stands watching his every move or tactical play. But that is exactly what happened and now you have Alan Pardew dealing with a similar situation from 52,000 people each week. Every manager realizes what is at stake, but Pardew has the hardest management seat in all of England. Even Roy Hodgson is treated with more respect and the 3 Lions were a debacle in the World Cup. Lets look at this statistic. Alan Pardew is the second longest serving manager in the top flight. Only Arsene Wenger has been a his post longer…Mr. Arsenal himself. Pardew is a man seen as the constant problem. When we couldn’t score it was his fault. When the defense was leaky, he was the reason…etc. Is he really that bad or are we just that difficult to please? Lets look at Big Sam.Last year every West Ham United fan wanted him out and now they are knocking at Champions League football. All of sudden the air around West Ham has changed and he is again seen as a savior/mastermind. He was given the time and funds needed to succeed in the toughest league in the world and its paying dividends. Lets not forget his is still without his best player Andy Carroll, but also was shrewd enough is getting the midfield maestro Song from Barcelona. Now lets take a closer look at Pardew and the past few weeks. 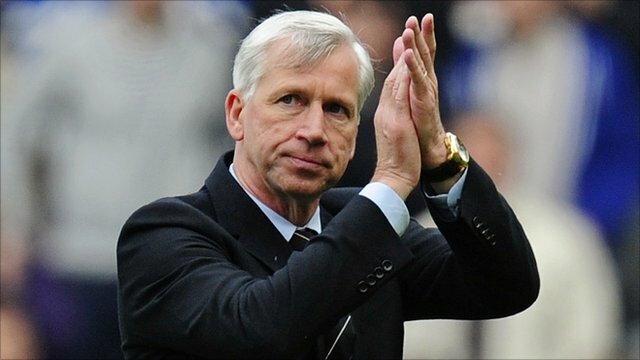 In 3 weeks, Pardew has gone from a villain to a hero and all because he did what Newcastle fans want most……WIN! He beat a Leicester team that decimated Man United, a Spurs team loaded with talent away, manhandled City away and beat Liverpool at home. Three out of the four games should have been losses on paper, but they weren’t and the congratulations must be directed at least in part towards Pardew for his game planning and understanding of what team he must field to get the all important W! Yet, we want more now that we have tasted this success. It is impossible to think that any team nowadays will ever complete the undefeated run Arsenal had some time ago. Alas, we as Newcastle fans expect nothing but top four and winning week in/week out. We should be at least proud of Pardew’s consistent positive views of the city, team and fans. He could have turned his back on us at any time. There were banners, websites, protests and even t-shirts made out for his sacking. They said he wasn’t the man for the job. He lacked the class and touch someone like Sir Bobby had. However, I challenge any of us to play a team that spends at least 10x more than you each year in transfers with a youth based side and beat them away. He lives by his choices and he dies by his choices but Pardew sticks by them. He does not give excuses about his own tactical mistakes or faults. He is human as are all managers. They choose their team and players. They put out a starting eleven with the best chance to win on that given day. Whether you agree or not with the selection, transfers or even ideology of a manager there must be an understanding and respect. I applaud not only Newcastle for their dedication to not sacking Pardew, but to all clubs that give their managers adequate time in order to right the ship. Loyalty is not where it should be today but maybe just maybe Newcastle showed us it is still alive. Where to start eh Harry? The more you lose the quicker you get sacked? Did you not see Newcastle at all last year? Loser central. And he didn’t get sacked so already your article is falling apart because Mike Ashley operates differently. And that’s what your ‘article’ should be titled. Mike Ashley reaping rewards, as he is the hierarchy. No Pardew’s not a hero, at all. All he has done is his job for four weeks. Real war hero he is. Let’s get it right, like all other cup matches he plays weakened teams, because he is told to. We got lucky against man city. As can clearly be seen, they’re going through a poor patch and clearly didn’t want to be there on Wednesday with a Manchester derby coming up. But keep acting like he done it on purpose. Why hasn’t he bothered with cups the past four years then if he’s such a hero? Why haven’t we beat a decent team until now? YOU might want top four, like Pardiola at the start of the season proclaimed we were going for after saying this was his best squad ever! But most realistic supporters know it’s just a joke to make people like you think we’re going to give something a go this year instead of just chugging along picking up wages for finishing above 18th. Why would he turn his back though? He lucked into this job and will never get one anywhere near as big as it. Hence, he’s clinging on no matter what for his pay off, and that’s fair enough. There are people out there with a bit dignity though who might have played it differently. Saying that, I doubt anyone else would’ve pushed a linesman, called another manager an old c*nt and the cherry on top of him head-butted an opposing player for no reason at all. Firstly, this is written by Ryan Wolfe (as aformentioned at the top of the article. And secondly, this is an opinion piece. Everyone is entitled to their own opinion, so try and suppress the sarcastic, misinformed comments. Also, where on earth is the author proclaiming that we genuinely expect top four. Perhaps read it with a slight sense of irony, and we’ll be on the same playing field, my friend. It is the negativity from fans fans like you that mars the reputation of our fine club. Pardew is not a good manager. At all. he has these peaks(every now and then) and troughs all the time. Ahh the Newcastle fan is indeed a pessimistic one, someone has take the time to write an article out of their own passion for their club so have the courtesy to allow them an opinion, it is indeed their right as a human being to do so. Our great club deserves better but negative attitudes are not the way forward, reality can be a cruel mistress after all.